Fisher Price is a brand that I’m sure most people are familiar with, whether they have kids or not. 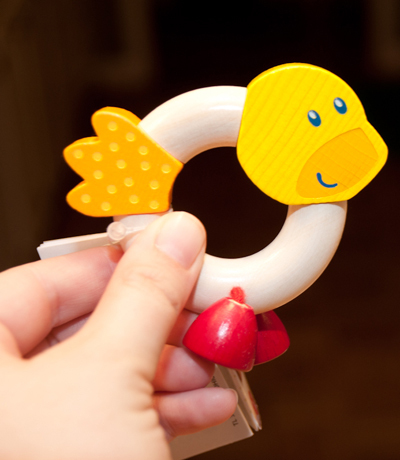 I think most of us can probably remember a Fisher Price toy we played with a child – it’s been around for a long time, and it’s a brand I associate with quality. 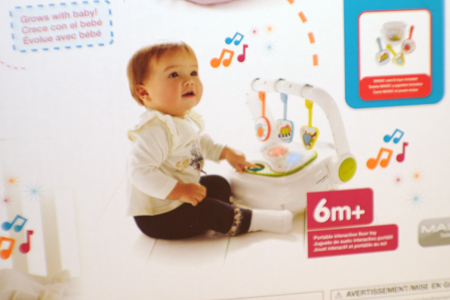 Of course, they don’t just make toys – they also have great baby gear. We’ve been keeping an eye out for a good infant tub to use this time around. 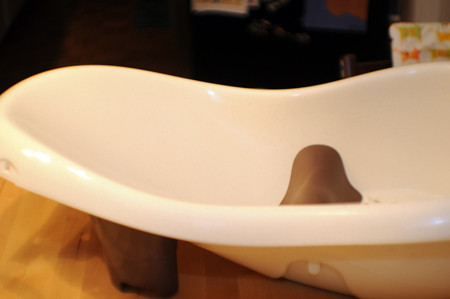 I knew I wanted one with a sling in it because it makes it comfortable for the baby – and easy to bathe in. I discovered the Calming Waters Vibrating Tub, and knew it sounded like one we’d love. 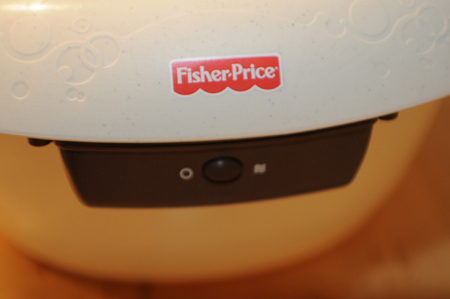 This tub has all of the features we loved about our last Fisher Price tub – and more. The most noticeable of all the features is the vibration. It’s something we all know is soothing to babies, which is why it’s included in so many infant rockers, bouncy seats, and swings. 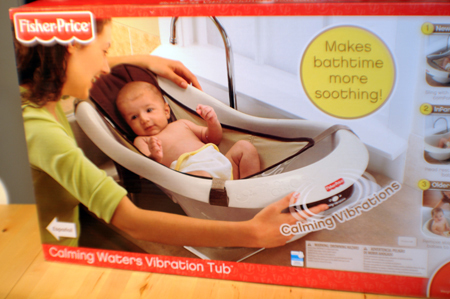 So it makes sense to have it in the tub, too, to help babies relax. Aside from the vibration, this tub is still top of the line and has a lot of smart features. Another of my favorites is the hook that they’ve attached, making it easy to hang out of the way. I love this because that was one of my biggest pet peeves with our old tub – where to put it when it’s not in use. 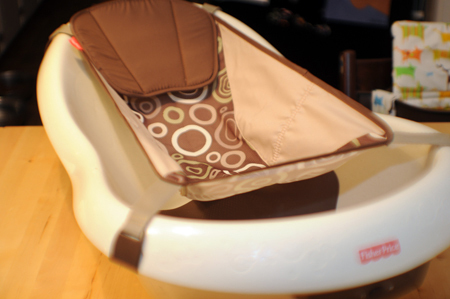 It also includes a (removable) sling and headrest, allowing you to make the tub extra comfortable for newborns, but easy to modify for older babies to sit in. 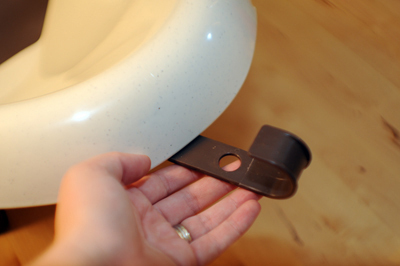 There’s a stopper in the tub too, so even when you want to stop using the sling it’s easy for your baby to recline in the tub without slipping. 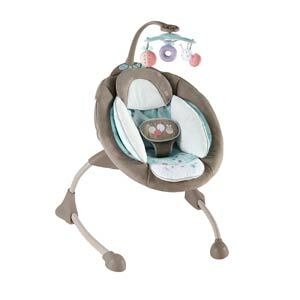 It’s removable too, but I can see using it for quite a while until our baby is stable at sitting up. The tub fits well in most single and double sinks, and of course you can use it in an empty tub, too. It has a drain plug to make it easy to drain. I can’t see any negatives about this tub! I love that it’s nice and neutral but still stylish – it’ll fit in well with any bathroom decor. The tub retails for $42.99, which is just $10-$12 more than other Fisher Price tubs without the vibrating feature. 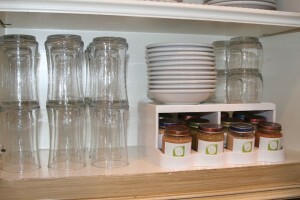 This would be great to add to your registry or perfect for a shower gift! Note: We received a Fisher Price Calming Waters Vibrating Tub to facilitate this post. I was not compensated monetarily. All opinions are honest and are my own. Carter’s Watch the Wear is a brand that has been around for over 150 years, having started out as the premier manufacturer of denim overalls and ‘work wear’. Their overalls were famous throughout the United States. Throughout the years they expanded to include boy’s overalls, coats, jumpers, painter coats, and shirts in their line. 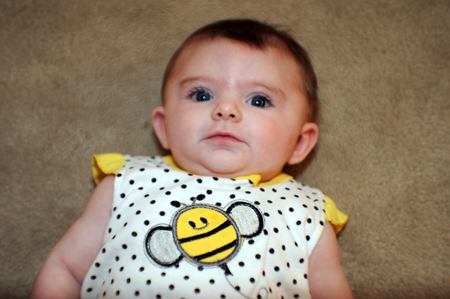 Now they have adorable newborn, infant & toddler clothing, which is what we got to review. I had never heard of the brand before (I mistakenly thought they were a part of Carter’s – they’re not) but was excited to try out an affordable option for baby clothes! We were sent four items for review. My favorite outfit we received would fit our baby at the wrong season, so I gifted it to my friend Amanda‘s daughter Rea. Isn’t it cute? 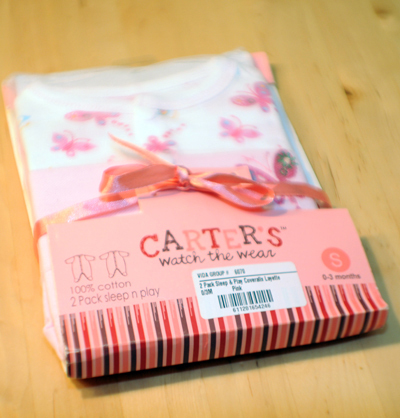 The products from Carter’s Watch the Wear are very affordable – for instance, the blankets above typically retail at $9.99, and are on sale right now for $6.99. The material on the clothing and the blankets is noticeably thinner, in my opinion, but with the low prices these items make great options for day-to-day use. Two lucky readers will each win a $25 gift card to Carter’s Watch the Wear – and trust me, that’ll go a long way with their affordable prices! This contest is open to all U.S. residents aged 18+. Entries will be accepted until the end of the day (midnight Central) Friday, July 20. By entering this giveaway you agree to the Official Rules. Note: I received clothing from Carter’s Watch the Wear to facilitate this post, and they are providing the gift cards for this giveaway. I was not compensated monetarily for this post. All opinions in this post are honest and are my own. Since finding out I was pregnant, I’ve been on the hunt for a great stroller – and once we found out we were having a girl, I knew I wanted to find something pink! We were thrilled to discover the Contours Options 3-Wheeler Stroller and all the versatility that it provides. 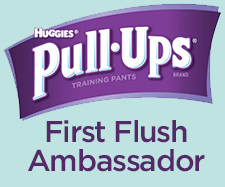 As a Contours Mom, I get to bring you all the latest on Contours products and host giveaways for them, too! 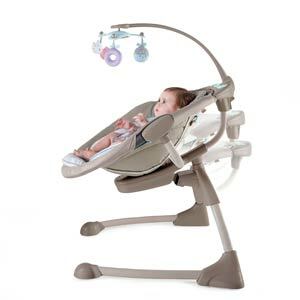 If you remember, a while back I won a Contours Classique 3-in-1 Bassinet from another blog, so I was a fan of Contours even before being accepted into their bloggers program. Their products are not only well-made and great to look at, but they all serve multiple purposes or work in multiple ways, which adds even more value to them! Brian put the stroller together pretty soon after it arrived because we were eager to see what it looked like – he said it was a really quick & easy process, which started our opinion off on the right foot! Our baby isn’t due until September, but we babysat our friends‘ daughter Rea and let her try the stroller out. As you can see in the photo above, the seat of the stroller reclines nicely for younger infants (it has three options – fully reclined, 45 degrees, and 90 degrees), and there’s a nice (removable) cushion around their heads for when they’re especially little. 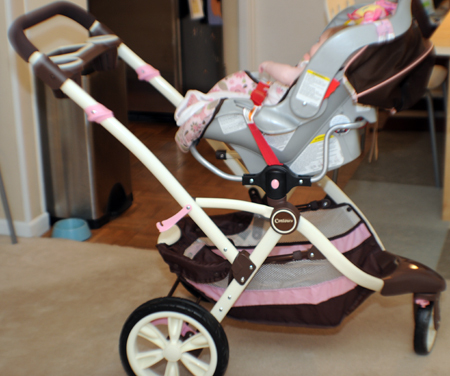 I also love the print on this stroller – it comes in red & black, too, but we loved the brown & pink combo of the Blush stroller. Another thing we love about this stroller is that you can use a car seat attachment to use your baby carrier with it. When your baby is asleep, it’s nice to be able to just move the car seat and not have to disturb her. The attachment works with most car seat brands – visit the stroller page for a full list of brands. 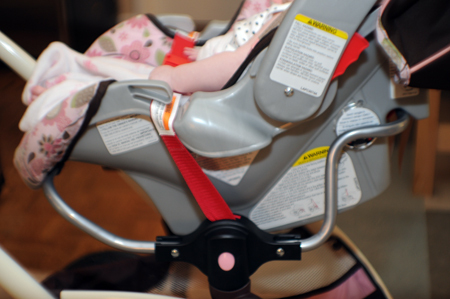 This attachment allows the car seat to clip in at the back, and also has a strap that buckles over the top of the car seat giving you even more stability. 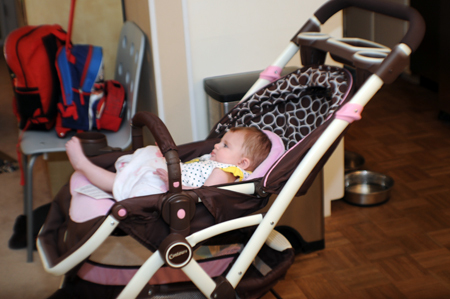 You can have your baby facing toward or away from you as you push the Contours stroller. Another unique feature is, of course, that it has 3 wheels instead of 4 like many strollers. The front wheel is 8″ and swivels, allowing for easy maneuvering, and there are two 12″ wheels in the back. We were impressed with the amount of storage the basket underneath the stroller provides – and how easily accessible it is. There’s a tray by the handles with two cup holders and a tray perfect for your phone and wallet, and then there’s a cup holder for the baby as well. The stroller is easy to fold with a trigger, and folds up to a nice compact size – that’s important for us because with soon-to-be three kids our space will be a valuable commodity! The Contours Options 3-Wheeler Stroller retails for $169.99, which is a very competitive price, especially for the quality this stroller provides. I know you’ve got to be excited about this stroller after seeing all of its amazing features, right? Well, get ready to be even more excited because here’s your chance to winone of your own! One lucky reader will win a Contours Options 3-Wheeler stroller in their choice of print (ARV $169.99)! This contest is open to all U.S. residents aged 18+. Entries will be accepted until the end of the day (midnight Central) Saturday, July 28. By entering this giveaway you agree to the Official Rules. Note: As a Contours Mom, I received a stroller to facilitate this post, and one is being provided for this giveaway. I was not compensated monetarily for this post. All opinions in this and the other post are honest and are my own. Five of the giveaways have ended, and these are the lucky ladies that won – Jessica actually won TWO! Congratulations to all of the winners – and don’t forget there are still many giveaways live in my sidebar on the right! 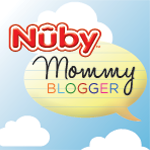 Have you been loving all the great baby products I’ve featured so far this month? I’ve had a blast working on this (even during those late nights, of which there have been many) and have discovered so many new favorites. I’ve also gotten the opportunity to work with amazing companies, and have been thrilled with the response of those wanting to participate! June is coming to a close, but I still have a few more products I’d like to feature… and I didn’t get to do all the fun pregnancy & baby posts I’d planned on, because I didn’t realize how much time the product posts would entail each day! So, I’ve decided to extend the Extravaganza through the end of July. I’ll have a more relaxed posting schedule, but I’ll still be bringing you great products and some fun content. I’m looking forward to the second phase of the Extravaganza! And don’t forget, there are many giveaways that run throughout part of July – you’ll definitely want to enter at least a few of them! 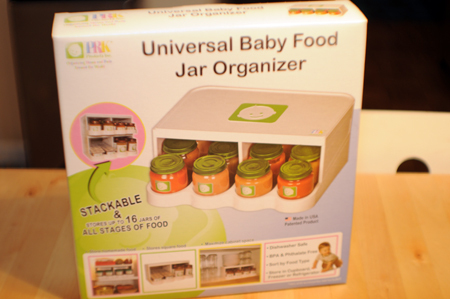 I love being organized, but as any parent of a baby knows, it’s easy to get bogged down with all the baby gear you have. 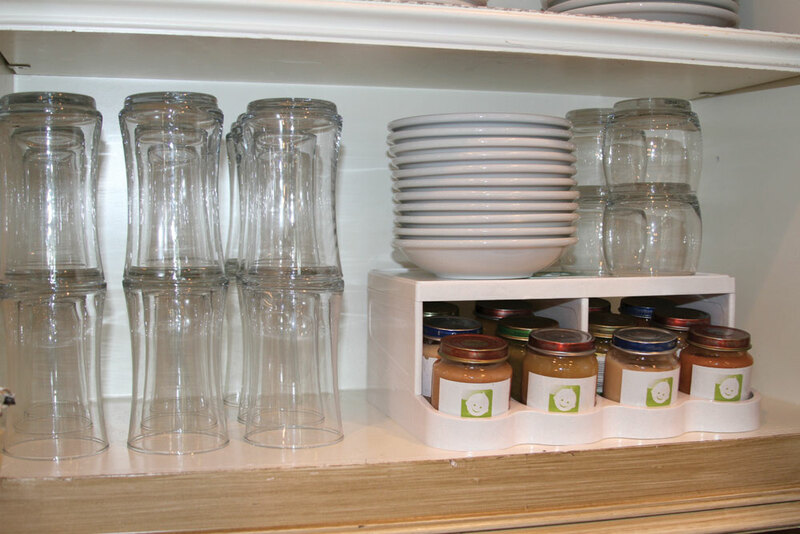 I know when J was born we had a hard time figuring out how to keep our kitchen cabinets organized with all of the bottles and accessories. 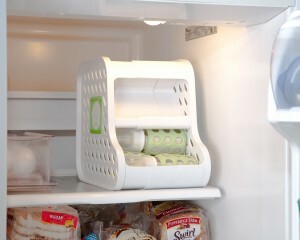 This is a problem many people have, but PRK Products has two items that will make getting organized easy! 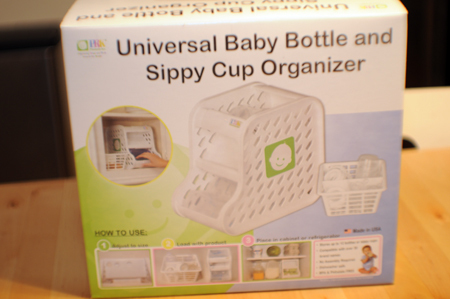 One lucky reader will win a Universal Baby Bottle & Sippy Cup Organizer, and another will win a Universal Baby Food Jar Organizer (each have an ARV of $24.95)! This contest is open to all U.S. residents aged 18+. Entries will be accepted until the end of the day (midnight Central) Wednesday, July 18. By entering this giveaway you agree to the Official Rules. 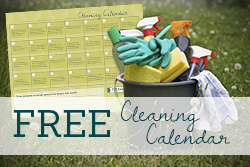 Note: I received organizers to facilitate this post, and prizes are being provided for this giveaway. I was not compensated monetarily for this post. All opinions in this and the other post are honest and are my own. Facts about the products are gathered from the PRK website. With all of these pictures being taken, it’s even easier than ever to capture a perfect moment. We keep a lot of our digital images as just that – digital. But we have some favorites that we just had to print. 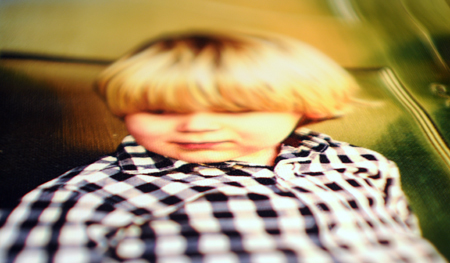 Signazon allows you to make images even more special by getting a canvas print. I just love the texture of canvas, don’t you? It adds depth to the picture and really does make it seem more like a work of art. We got to order a canvas for my review, and I uploaded an image from our Christmas card photo shoot. The process of using the Signazon site is really easy – the only trick I discovered is they list height by width instead of width by heightfor their images, so make sure your photo works proportionally for the dimensions you’re selecting. You can even add the option of having your canvas wrapped around a frame or having grommets added for ways to display it. And Signazon offers other options too. Having a party? You might want one of their congratulations banners. Starting your own business? You can get custom vehicle magnets. And you know all those window decals you see on the backs of people’s cars? You can get your own unique design. 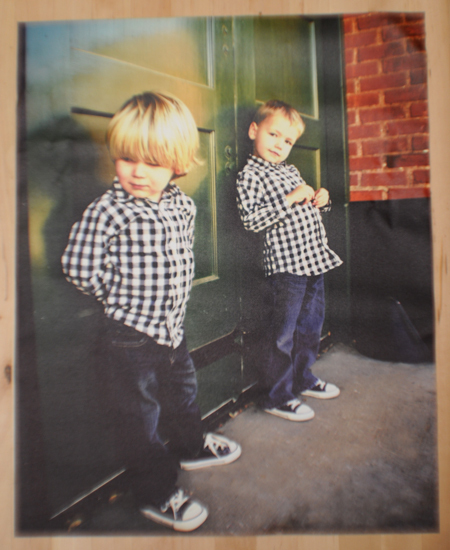 One lucky reader will win a custom 16×20″ canvas print from Signazon! This contest is open to all U.S. residents aged 18+. Entries will be accepted until the end of the day (midnight Central) Wednesday, July 18. By entering this giveaway you agree to the Official Rules. And if you’re looking for yet another chance to win, Signazon is hosting a giveaway on their Facebook page for $100 store credit! The giveaway ends on July 4 so be sure and enter soon! Note: I received a custom canvas to facilitate the review, and Signazon is providing the prize for the giveaway. I was not compensated monetarily for this post. All opinions in this and the other post are honest and are my own. You probably read my post earlier this month about The Children’s Place, and all the adorable clothes I got for our baby. 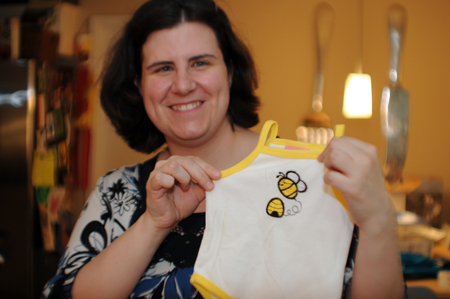 Well, did you know that not only can you find great clothes for infants and kids… they even have a Baby Shower Shop? Pretty good idea, isn’t it? All the best in baby shower gift ideas are right at your fingertips, making it easy to quickly put together a perfect gift. You’ll find gifts for virtually any price range, and when you order from their website you can even have gifts shipped directly to the recipient’s door. 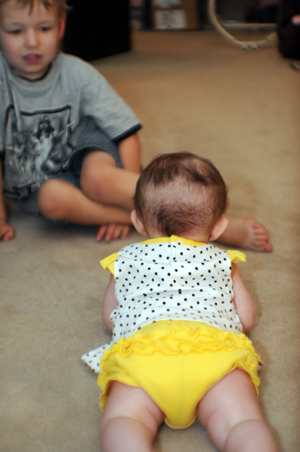 In my other Children’s Place post, I’m hosting a $25 gift card giveaway. 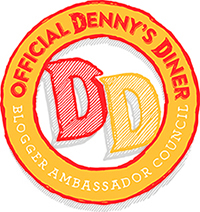 Well guess what – they’re providing a gift card to go along with this post, too! 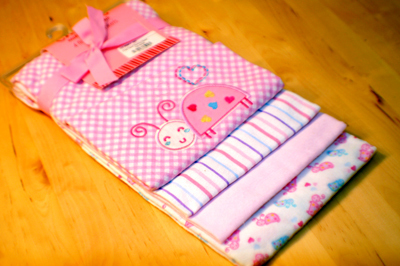 This will be perfect to use on a gift from the Baby Shower Shop, or on something for your little one. One lucky reader will win a $25 gift card to The Children’s Place! This contest is open to all U.S. residents aged 18+. Entries will be accepted until the end of the day (midnight Central) Wednesday, July 18. By entering this giveaway you agree to the Official Rules. Note: I received a gift card to facilitate the review in my other Children’s Place post. All opinions in this and the other post are honest and are my own. With technology always expanding, people are more often than ever expecting products to “do it all.” Our cell phones aren’t just phones anymore, cars are entertainment and GPS aides, and we want more out of our printers. The printer’s size is a huge benefit because many people are dealing with limited space in their work areas. At 15.4″ x 11.8″ x 5.7″ it is easy to fit in wherever you need it. 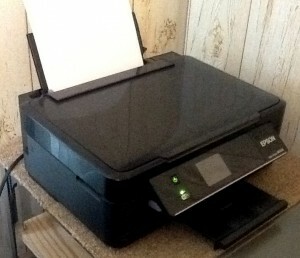 The wireless feature is another aspect of the printer that I love. 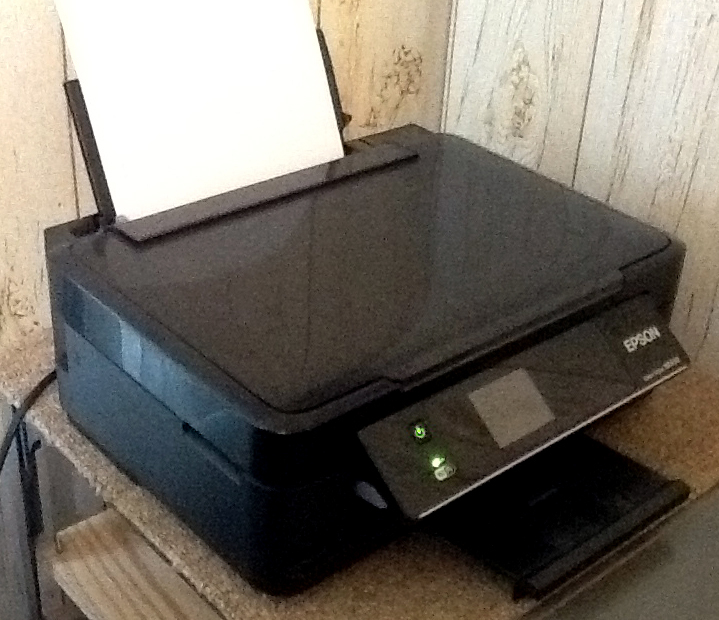 It’s incredibly easy to print from anywhere in your house, not bound by the length of your USB cable. I’d give the NX430 5 stars – it’s priced at under $100 and has all the features you’d expect from a much more expensive unit. It’d be great for college students… I mean, how many printers can fit in those tiny dorms and do all this printer can do? 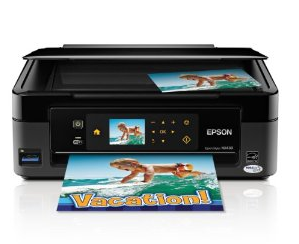 We’ve always had a lot of confidence in the Epson brand, and this printer just proves to us yet again that Epson printers are the way to go. Note: I received an Epson Stylus NX430 for review. I was not compensated monetarily for this post. All opinions are honest and are my own. Mamas & Papas is a UK-based brand that has been around for 30 years, and focuses on a passion for parenting and commitment to providing a world of inspiration for new parents. They aim to provide a world of color, style, innovation and quality. I am in awe of the aesthetics of virtually every product from this company – sleek, but yet still cheery and perfectly baby-appropriate. I got the chance to review the Galaxy mobile, and I have to admit that until the box arrived I didn’t know what to expect. A mobile, I guess. This, my friends, is a MOBILE. One that transitions easily to become something useful and entertaining for long beyond the first few months. Even just removing parts from the box I knew this was going to be a high-quality product. Everything felt solid, not flimsy at all like some products can be. 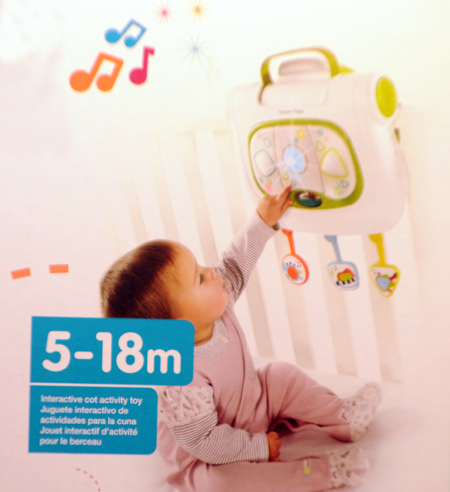 And I know I mentioned the aesthetics a minute ago, but it has to be said again that Mamas & Papas has done a wonderful job of somehow making this feel both charming and engaging for babies, and techy/slick enough that they’d fit in at a high-end electronics showroom. It is worth noting that the Galaxy retails for $179.99, so all of the quality, features and versatility do come at a price. I will say this, though – the average mobile costs around $40-$45… and is solely a mobile you can use on your baby’s crib for a short period of time. The Galaxy’s usefulness will last far beyond that of regular mobiles. 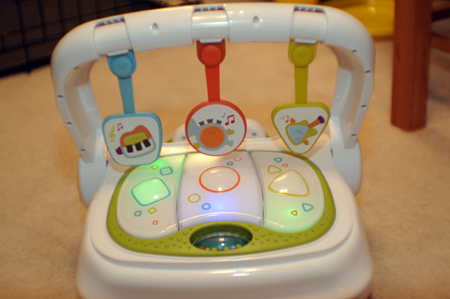 I initially set the Galaxy up as a floor toy, and the boys had a lot of fun pressing the buttons and hearing all of the different music that played. I asked what they thought of it and they also liked the lights a lot. They’re colorful, but masked behind the translucent white they also have a peaceful feel to them. I love that the buttons are large and easy for little hands to maneuver. 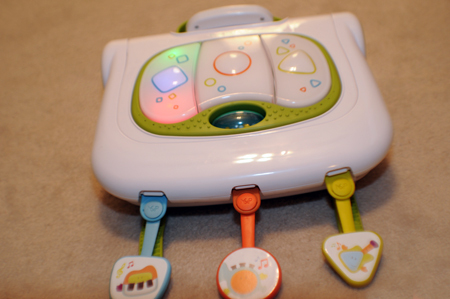 When you push a button, it lights up and music corresponding to the instrument pictured above plays. 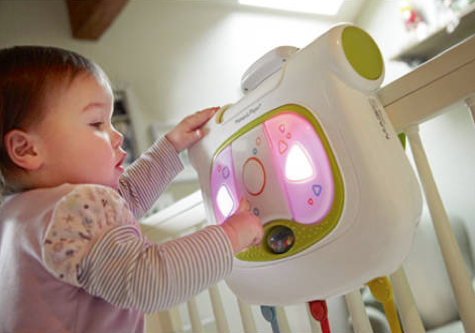 It’s very serene, which makes it great for use in a crib – it’s engaging but not overly stimulating or loud. 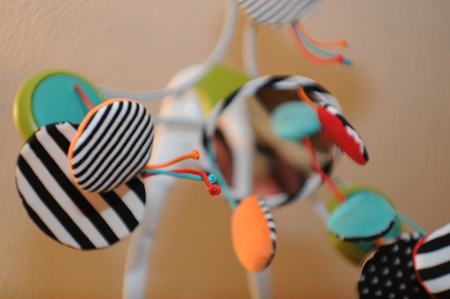 And of course in the very early stages you can use the Galaxy as a traditional mobile – it has great, high-contrast black & white elements that spin around slowly for your baby to watch. We adore the Galaxy and are really excited to use it with our daughter once she arrives. And I’m personally thrilled to have been introduced to the Mamas & Papas brand, because their products are amazing. Did you know you can find them at Babies R Us? I am definitely planning on getting their Baby Snug seat – it looks amazing, and I’ve heard a lot of great reviews on it (especially compared to other competing seats). 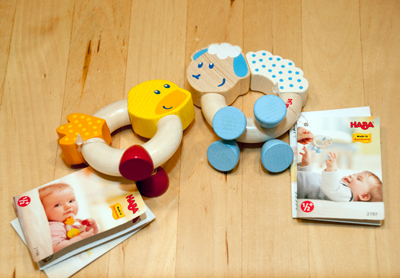 Be sure and keep up with Mamas & Papas on Facebook to get all the updates on their latest products! 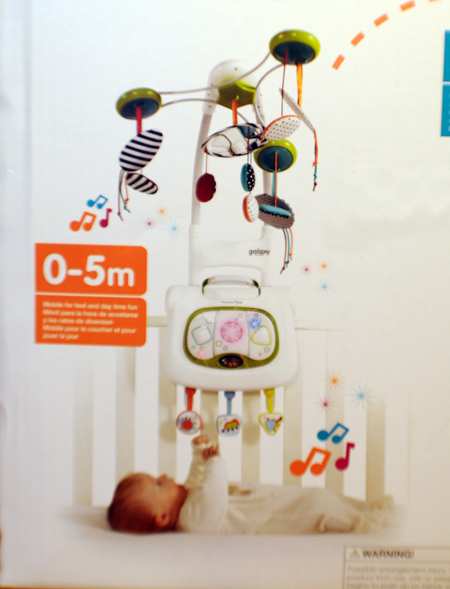 Note: I received a Galaxy mobile from Mamas & Papas to facilitate my review. I was not compensated monetarily for this post. All opinions are honest and are my own. I think every parent is on the hunt for that elusive product that will actually calm their baby. We’d heard of a couple of different options on the market, but once we saw the Cozy Coo Sway Seat by Ingenuity in action, we were sold. We had been sent the seat for review, but of course our baby isn’t due until September. We recently babysat for our good friends’ girls – one of them is 4 months old and is very attached to her momma, and she just was not happy to be left with us! She cried pretty constantly… until we had the idea to try out the Cozy Coo. 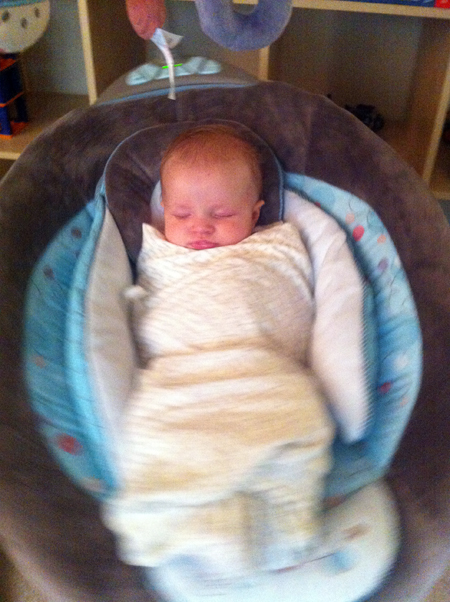 Brian assembled it really quickly, we swaddled her, and then set her in the seat to try it out. And she loved it! Before we knew it she was happily asleep. I took a little video of the seat in action so you can get an idea of what the motion is like. 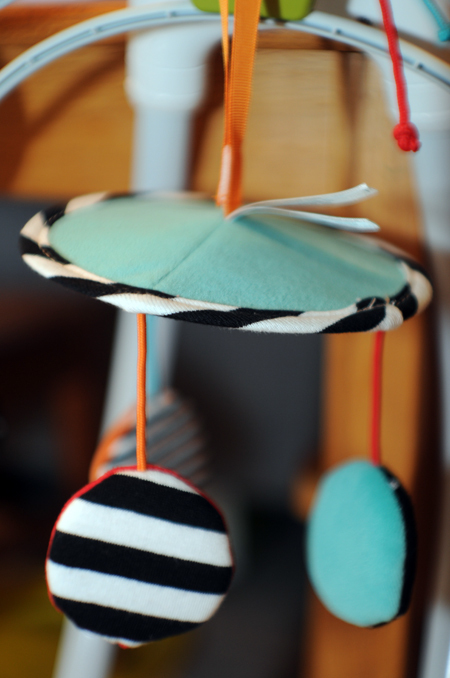 It’s very different from what you get with traditional swings, and I can see how it’d be appealing to little ones! Aside from the unique swaying motion, I think my favorite feature about this seat is that you can actually plug it in and not blaze through batteries like you have to with swings. You have the option for battery usage if you need to use that, but I think most parents will agree that the ability to plug this seat in is HUGE. 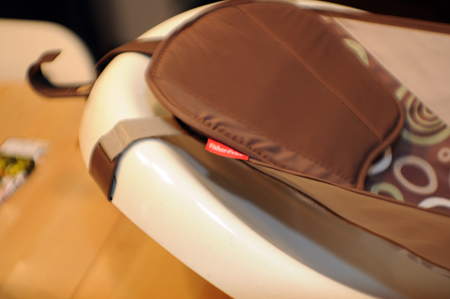 One lucky reader will win their own Cozy Coo Sway Seat (ARV $139.99)! This contest is open to all U.S. residents aged 18+. Entries will be accepted until the end of the day (midnight Central) Tuesday, July 17. By entering this giveaway you agree to the Official Rules. Note: I received a Cozy Coo Sway Seat to facilitate my review, and one is being provided for the giveaway prize. I was not compensated monetarily for this post. All opinions are honest and my own.